TURQUIE – Güvercinkaya - An excavation at the 7,000 year old Güvercinkaya tumulus in Aksaray Province has discovered the fossilized remains of such animals as lions, panthers and two species of horses, indicating that these species once lived in Cappadocia. Güvercinkaya tumulus was discovered near the planned site of the Mamasun Dam when surface research for the dam was underway in 1993, said Dr. Sevil Gülçur, who heads the Güvercinkaya excavation. 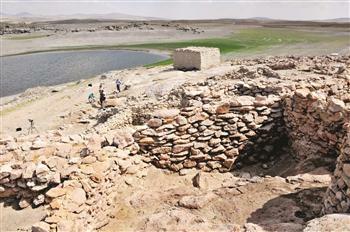 “In order to save the area, we started excavation work in 1996 and excavated the damaged areas firstly,” Gülçur said. “We worked on an area 3,000 meters square, found some very significant structures at the peak of the tumulus. The use of the tumulus dates back approximately 5,220 to 4,750 B.C. We came across the gate of a castle, which is probably it is the oldest example of its kind in Anatolia,” Gülçur said, “The tumulus is divided into two fragments, an upper settlement and a lower settlement. The whole architecture was developed by design. It is not a random settlement; they designed the settlement to comply with the natural structure of the rocks. The one-roomed houses have storage and furnaces. Their means of livelihood was based on agriculture and livestock.” Food remains at the site have revealed a great deal of information about ancient Cappadocia, including the fact that two species of horses once existed there. “Two [species of] horse existed; one of them is bigger than the other. When the Persians invaded Anatolia, they saw the great number of horses and called the land ‘Cappadocia’ which means ‘land of beautiful horses,’ and the Romans continued to use the name. In addition to horses, there were a lot of deer in the region. We also detected the presence of some predators, including lions and panthers. 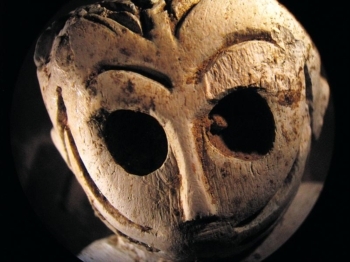 The Cappadocia region had the raw material prehistoric humans needed to survive. For example, we found a leg bone and claw that belonged to a lioness. It is hard to say whether people in those times ate lion meat, but they did benefit from lions’ bones and skins.” The excavation work continues to try to save the area from possible damage created by the dam, Gülçur said. “A very frightening thing happened in Güvercinkaya when the level of the water in the dam rose and covered the whole area in 2011. The dam damaged the areas we had excavated, and now we are working to reach the old layer and clean the excavation site. This year we are determined to find older layers and document the layers and structures we have already excavated with photos, in order not lose the information if the water rises again,” she said. USA – Rosebud - A week before the Battle of the Little Bighorn in the summer of 1876, a much larger and longer battle raged in the hilly country on the Rosebud River 40 miles away. Somewhere between 1,500 and 2,000 Sioux and Cheyenne challenged a U.S. Army column of 1,300 soldiers, scouts and civilians in a fight that lasted about six hours. In contrast, Lt. Col. George Custer’s battalion had only about 700 troopers in the June 25, 1876, Little Bighorn battle that probably lasted less than two hours. Both sides claimed victory. The Sioux and Cheyenne, tired and hungry, eventually decided the fight was over and went back to their village on Reno Creek. Gen. George Crook held the field but left as soon as the dead were buried. Overshadowed by the disaster at Little Bighorn, the Rosebud fight, one of the biggest battles ever fought on the Northern Plains, slid more or less into obscurity. But a clash that big had to leave its mark on the land. A University of Montana archaeology field school, now in its second summer, is scouring the landscape this week looking for clues to how that monumental clash on the Rosebud was fought. With high-end metal detectors, the students, also including UM’s Andy Early, sweep systematically through the tall grass, waiting for a bleep that pinpoints buried metal. Each hit is marked with an orange flag and UM graduate Marc Wallace, with a GPS in his backpack, records its exact location. What they are primarily looking for are shell casings and bullets that can identify positions and who was doing the firing. Merritt explained that the soldiers were using standard issue Springfield single-shot rifles with standard issue ammunition. The Sioux and Cheyenne carried a variety of weapons from repeating rifles to muskets. 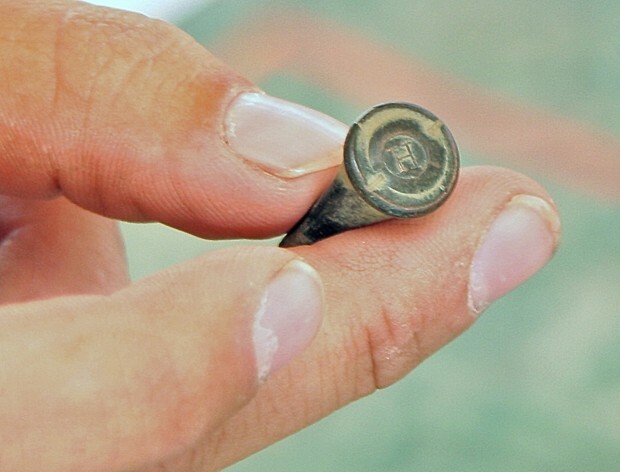 Merritt said that firing pin marks on the cartridges and barrel marks on bullets could identify individual weapons and show their movement on the field of battle. He hopes at some point to compare bullets and cartridges from Indian weapons used at the Rosebud battle with those found at Little Bighorn. The same alliance of Sioux and Cheyenne fought at both the Little Bighorn and the Rosebud. The team has already identified several soldier and Indian positions and raised some doubts about a commander's claim that he was under heavy fire. ROYAUME UNI – Monmouth - The pre-historic site at the Parc Glyndwr development has been confirmed as Bronze Age. 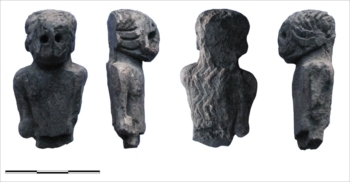 Monmouth archaeologists have published the latest radiocarbon dates from the Rockfield Road site and say the scientific results show the information given to the Heritage Minister by civil servants that the site was not Bronze Age was “manifestly erroneous”. 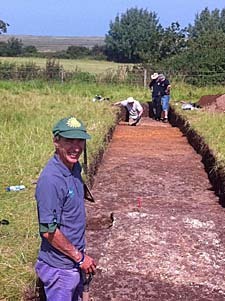 Monmouth Archaeology, a professional archaeological unit, has been trying for almost a month to refute a statement from the Welsh Heritage Minister Huw Lewis that the remains it is working on are not Bronze Age but are Roman drains. They claim that the Minister’s statement was based on a 10-minute visit by a Cadw representative while they have been working on the site since the spring. 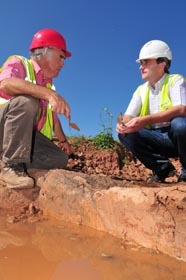 “The latest six scientific dates, which were produced by the Scottish Universities Environmental Research Centre, show conclusively that the site is Bronze Age and that one area is even a 1,000 years older,” said Steve Clarke of Monmouth Archaeology, who showed Monmouth AM Nick Ramsay around the site last week. ROYAUME UNI - Wood Burcote - An earthwork survey undertaken by Northamptonshire Archaeology as part of the planning application for 210 new houses at Wood Burcote Court has revealed that Wood Burcote was a larger hamlet in medieval times than had previously been thought. In fields on the east side of Burcote Road, opposite the ‘Birds’ Estate, the archaeologists found four low mounds that they think are the ‘house platforms’ where cottages used to stand. These cottages would have been the homes of farmers making a living from raising livestock, growing grain in the open fields and working in the adjacent woodlands. The hamlet of Wood Burcote is first recorded in 1200 but probably originated in the 9th or 10th century. It was one of a dozen hamlets with a ‘cote’ (meaning house or cottage) name within 5 miles of Towcester. The first reference to the hamlet being ‘Wood Burcote’ was in 1274 and suggests that the hamlet was surrounded by parts of Whittlewood Forest at that time. With no church of their own the small population of the hamlet would have to walk to St Lawrence’s Church in Towcester to attend services. This is also where they would have to take the bodies of their dead for burial.